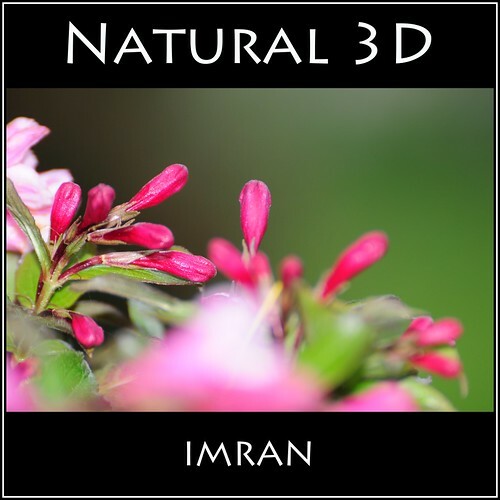 Natural 3D – IMRAN™ — 100+ Views Within Hours Of Posting!, a photo by ImranAnwar on Flickr. SOOC Image Straight Out Of Camera!! NO editing, tweaking, of ANY kind. Only framed in Photoshop & saved image as 6MB JPG. Handheld, 450mm zoom ISO250 at f/5.6 1/60 seconds with flash. Walking around my home after a morning of rain, I shot several photos of the wonderful flowers that were blooming in the beds. I was amazed by the almost 3D effect this photo’s bokeh background, the foreground flower and the sharply in-focus buds, created. No editing on these natural colors, brought to life by firing off the flash – though it was morning and an outdoors scene.